I am working on a ton of interesting projects right now. Not least of these is my classroom teaching at the community college. My fingertips are sore from typing. And yet there is always more to say. More to think about. More conversations to have. Here is a peek into one that is ongoing. Malke Rosenfeld and I have been going back and forth about math, dance, Papert and learning for a few months now. I am learning a lot from the conversation. She asked some questions this morning. Malke: A thought just entered my head — why are you offering TDI? Is it based on a question you are unsure of and want to see what others think? Or are you seeing a deficit in math teachers’ thinking that you want to shore up? Me: When ranting on Twitter, I could see that some of my assumptions about baseline teacher knowledge about fraction/decimal relationships as they pertain to developing children’s thinking were unfounded. That is, I was assuming teachers knew a lot more than they seemed to. Which has implications for my Khan Academy critiques, and lots of other writing on my blog. Yet people were also curious. So I wanted to say more in a way that would draw from and build on a larger collective knowledge, so it’s not just my spouting off. Malke: Is there a reason you offered it specifically as a course, and not a moderated discussion (which it sort of seems like right now)? Me: When you view learning as a social process, you tend to think of courses AS moderated discussions. I mean this quite seriously. I know that it goes against the grain of online (and face-to-face) course design. But that’s not because I think of online instruction differently from others; it’s because I have a particular view of learning that runs much deeper than that. If I tell and quiz, you’re not learning very much. If I propose a set of ideas, listen to what you have to say, encourage you to interact with others and move the conversation in directions that seem useful based on those interactions, you’re probably going to learn a lot. As long as I can keep you engaged in that process. Which is a different challenge online than in the classroom. Malke: Is there a place you specifically want your students to get to by the end of the seven weeks? Or are you just curious to see what develops? Me: I am curious to learn what I can about teaching at every opportunity. I want to produce “students” who can articulate important questions (see? learning as having new questions to ask?) about curricular approaches to decimals. Ideally, I would help them to develop a critical voice that speaks to/through them when they work with individual students, when they plan lessons and when they talk with their colleagues in a variety of settings. In short, I want to change the way teachers view the territory of decimals, fractions and children’s minds. Strange mix of lofty and specific there, huh? In recent weeks, I have written several times about decimals and their treatment in curriculum. In discussions surrounding that writing, it has become clear to me that everyone involved in children’s learning of decimals can both learn and contribute to the learning of others. For seven weeks, starting Monday, September 30, I will invite all interested parties to an online conversation about decimals and learning decimals. Each Monday, I’ll have a new post here to launch and focus our discussions. Comments will be closed in order to move the discussions to more productive venues (see below). Self study. Read at your leisure. Discuss with yourself, your colleagues, your spouse and/or your Australian Labradoodle. Twitter. I invite you to use the #decimalchat hashtag to respond, argue, offer evidence and discuss. Canvas. It is no secret that I love this LMS. I have established a course in Canvas. The course is public, free and you may self-enroll. We will mainly use the discussion forums there, which function MUCH better than WordPress comments for our purposes. 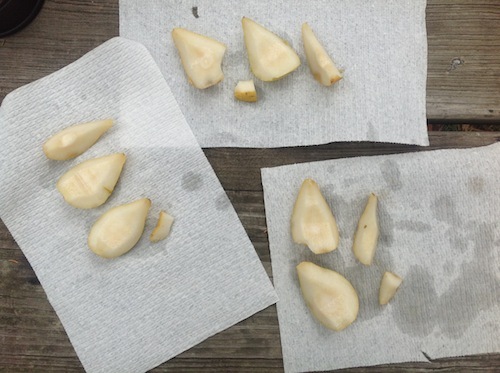 I will establish a new discussion forum there for each week’s post, but students (i.e. you) can also create discussions. You may come and go as you please. My promise to you is to keep myself on the schedule in the syllabus below and to engage to the extent possible in the discussions on Twitter and Canvas. Come join us for some or all of the following. Week 1 (Sept. 30): Decimals before fractions? Week 2 (Oct. 7): Money and decimals. Week 3 (Oct. 14): Children’s experiences with partitioning. Week 4 (Oct. 21): Interlude on the slicing of pizzas. Week 5 (Oct. 28): Grouping is different from partitioning. Week 6 (Nov. 4): Decimals and curriculum (Common Core). Week 7 (Nov. 14): Summary and wrap up. There will be no grades, tests or tuition. Just the love of knowledge and the collective passion of teachers wanting to do their best. 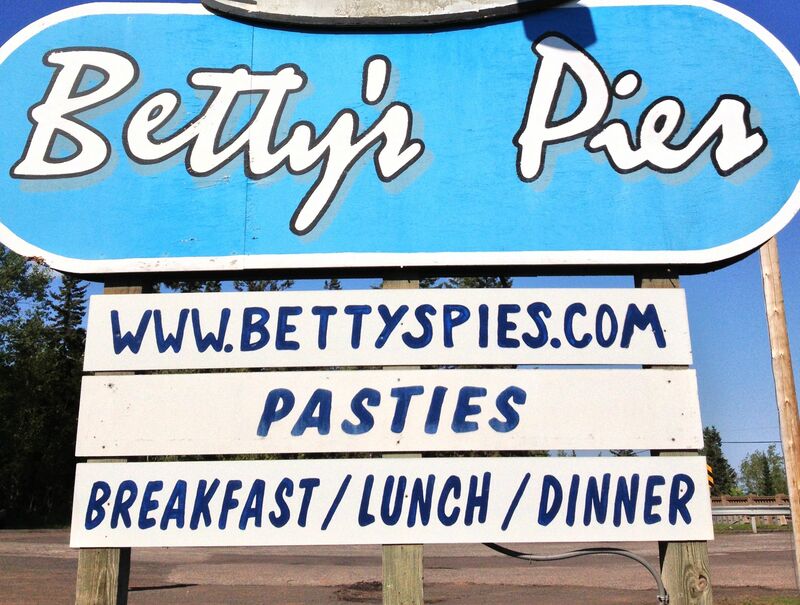 In Two Harbors, on Minnesota’s North Shore of Lake Superior is a popular stopping point for vacationers: Betty’s Pies. This restaurant moves a tremendous amount of pie each year. How much? Well, I’m not really sure because there was a smudge on the fact sheet on my menu. So how about it? 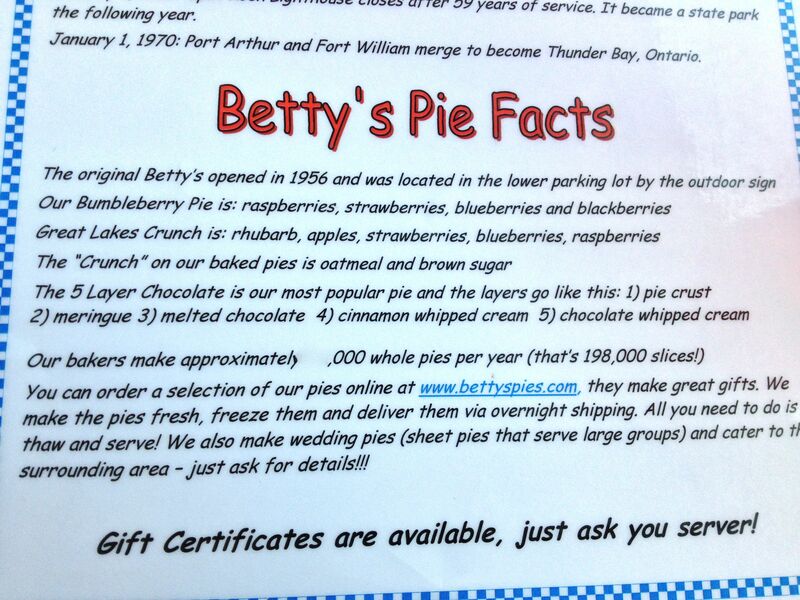 How many pies do you think Betty’s Pies makes each year? Let me know how you think about it in the comments, OK? Then you can click here to see the rest of Betty’s sign. Is it a good representation of how she cuts her pies? A few weeks back, Tabitha asked Why are zero and half the same? I was curious to know whether that conversation had affected her thinking in any way. So I asked. Me: Tabitha, do you still think zero and half are the same? Or have you not thought about that in a while? Tabitha (six years old): I think…Half isn’t a number. I mean, it’s made of numbers put together, but it’s not a number. Me: What is a number? I love this question. How people answer it can be revealing. I asked a version of it of Griffin when he was in Kindergarten. Me: Oh? is a number, but not one-half? T: Yeah. But it doesn’t really get used. T: Well, people say, 1, 2, 3, 4, 5, 6, but not . Me: Oh. So when we count count, we skip over ? We are both silent for a few moments, thinking. Me: Yeah. Isn’t that funny? It seems clear that has indeed been thinking about that conversation. She is struggling with the betweenness of ; that it expresses a number between 0 and 1.